The graphic designer in me couldn't resist attempting faux Pantone Easter eggs. I dyed these boiled eggs by standing them vertically in small cups of dye. Then I typed up the labels and printed them on ink jet temporary tattoo paper. Remember to print the words backwards! I used Silhouette brand tattoo paper I bought at my local PaperSource, but you can also get similar stuff from DecalPaper.com. I matched the color numbers using my chip book. Knowing they were correct gave me great inner satisfaction. These turned out super cute! Love! Those are the good sides of the eggs. :) There are a couple finger prints on the back sides in a few places. So awesome!! I attempted ombre ones, but with a 3, 5 and 1 year-old helping, it ended up being a revision of ombre, but oh well! Lol. These are AMAZING. Seriously. Best idea ever. These are so amazing I just died! Every year we start with lines and stripes on Easter eggs, but we never end with it. We created "Letraset-eggs" or "Keith Haring-eggs" for example but your idea is something new, worth to try, great. Love this. @April LOL at cease and desist. Not unlikely! you are my winner for 2012 eggs!!!!!!! beautifully blog posting i really appreciate for this blog thanks for sharing this post. What a fantastic idea! I love it! love love love it. happy with our eggs, but these are just so classy. Hi Jessica Jones, I'm Christie Jones! This is the first time I've visited your blog and I am blown away by these amazing eggs! You are so getting a cease and desist order :) I love this idea though! WAY cute! Jessica, this is terrific :) Would be fun to do on plastic eggs, too (paint instead of dye). Love it! I was thinking that you could only match the colors after you dyed them. LOL! I love these and would have totally matched them up too! EEP!! This are amazing. How clever to use temp tattoo paper. I'll have to keep an eye out for that. This is cracking me up! I love it! These are great! Love them! Love these! What a fun idea. Oh my goodness. These are AWESOME!!! :) Fabulous idea, I love it! i'm a french fan and i love all you do !! excuse my poor english ... i just say : "wouahh, c'est trop beau, magnifique, superbe !!! BRAVO !!!" Ma che belle! Grazie per aver condiviso l'idea! You are my hero! I love the ideas you come up with! Cute, clever, AND edible! Surely that all adds up to great art! ok maybe i'm just stupid, but i dont get it. first, what the hell is pantone? and second, they are just 1/2 dyed eggs, whats the big deal?? Hi! Pantone is the color matching system used by the graphic design industry. See this post for more info. AMAZING!! I heart Pantone! I am truly inspired. Thank you. ...and I also featured your Easter eggs ! Haha, fun!! What a great idea, and well executed - especially combining the right numbers too. Just taking a minute to celebrate your total brilliance. So brilliant! We love these so much we want to feature them on our blog (with a link to your site, of course!). Thank you for the amazing inspiration! Keep it coming! Brilliant! 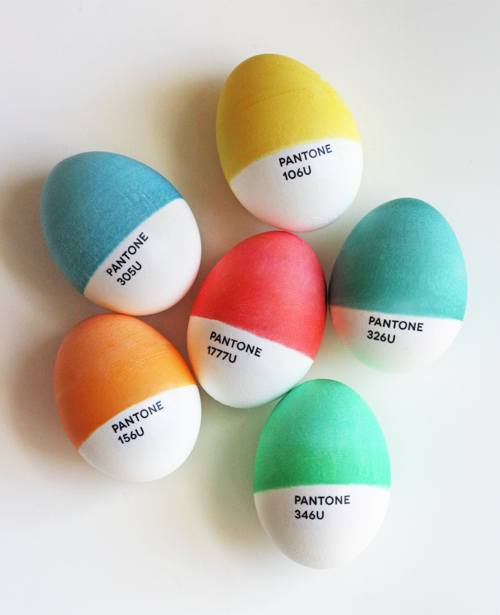 :) Just wanted to let you know that your cool Pantone eggs have been featured in my Easter roundup! WOW! I love this post and have included it to my Easter egg round up. Love these! Possibly the best Easter eggs I have seen in a long time. ~M. I had to check out Paper Source after I saw this. Those Easter eggs are a really good idea. It's a very original and personal take on it. Are these raw eggs, how do you make them white? What inks do you use to dye them? I live in the uk our eggs are brown. Thanks! Super excited to make. White eggs are more common here than brown. I'm afraid you will have to get eggs laid by different chickens! I forget now whether I used standard food coloring (like for coloring frosting) or an actual Easter egg dye kit with the tablets that dissolve in water and vinegar. We can purchase egg dye kits here at Easter time that are super cheap. Oh, and the eggs are boiled. Peel and eat! I saw these in the Pinterest Easter email and clicked on it so I could send the link to you, haha. I guess I know your tastes. These are awesome, love the idea of using the tattoo paper for this! In Eastern Orthodox Christianity, painting eggs for Easter is a common tradition.